This conglomerate is faithful with its flip phone, despite its thousands of trillions of wealth. He is Warren Buffett, owner of Berkshire Hathaway financial company and a big investor. Buffett, whose latest treasure is USD 88.6 billion, is also one of Apple's biggest shareholders. But he claimed not interested in buying the iPhone. The world's third richest man, based on Forbes Real Time Billionaire data, claims to use Samsung's flip phone, whose capabilities and style are ancient. He was not interested in replacing it with smartphones like the iPhone, although Apple Dealer, Tim Cook has often been offered. "Tim Cook sent me another Christmas greeting card this year, which says he will sell my iPhone this time and he sends it every Christmas," he said. Buffet is known for its simple lifestyle. Buffett still lives in the house he bought in Nebraska in 1958 for $ 31.5 thousand (adjusted to the current conditions cost about USD 262 thousand). In addition, he is also very charitable. 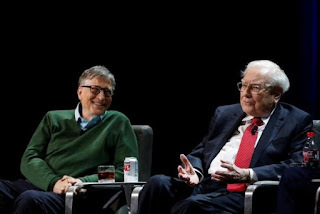 Together with his friend Bill Gates, Buffett is keen to campaign for the Giving Pledge program so that the rich will contribute most of his wealth to humanity. Berkshire Hathaway, owned by Warren Buffet, is Apple's fifth-largest shareholder, worth $ 23 billion. Buffett admits that he has never sold his shares since he first bought them in 2016. 0 Response to "Got Wealth USD 88.6 billion, This Man is Faithful Use Old Mobile Phone"